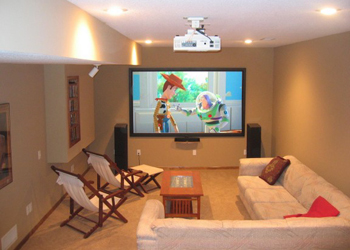 Indulge your craving for bold, big-screen entertainment at home with a fully automated electric projection screen that lowers the moment you turn your projector on! "The Home Cinema 8350 is one of the finest values in projectors we've ever seen, and we are enhused to give it our Editor's Choice Award." Look no further than EPSON for your home entertainment solutions. Convenient and affordable; enjoy your high definition entertainment experience - presenting movies, sports, and video games like you've never seen them before. A solid line up of Epson projectors provide you with 3LCD 3 chip technology, superb contrast ratio of up to 50,000:1 for sharp, distinctive details. And those details shine bright, day or night thanks for up to 2000 lumens of colour and white light output. With the 12V trigger on the Epson projector; you will be able to automatically lower your projection screen when you turn on your projector. Contact Presentation Partner for your complete Home Theater Package that would include a projector, mount, projection screen, and cabling.